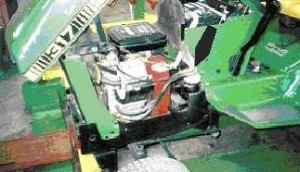 Some quick answers to small questions about small engines and garden tractors. Q: Can you help me with balancer timing on a Kohler K341 engine? There must be a better way than counting crank and balance teeth clock or counter clockwise rotation. Any help would be great. A: Kohler makes a tool for timing those 2 balance gears. Check with a Kohler dealer and they should be able to help you out in getting one. Q: How fast is a 18 horsepower engine? A: This engine runs at 3600 RPM’s at full no load high idle. Q: What size battery will my John Deere 317 garden tractor need in order to try to get it working again? A: The correct battery size is a MT 26. Q: My John Deere tractor has an 18 horsepower Onan engine and it will not recharge the battery. What part do I need? Is it a starter/alternator combination? A: No, it is not a starter alternator combination. Sounds like you might have a bad rectifier. Q: I have a Cub Cadet 1440 with a 14 hp V-Tech Vanguard engine. Yesterday I noticed an oil leak at the front crankshaft seal and a noise I assume is from the front bearing. From the diagrams, it looks like the bearing is in the front cover directly behind the seal. Can this bearing be replaced with the engine in place without breaking it down and or pulling the front cover? A: Yes, you can put the seal in without removing the cover, but it is a hard job. I have a 318 with a 46″ deck, it has just recently started throwing off the mule drive belt. I found some play in the mule drive where the shaft goes through the housing. Could that cause my problem,if is there any way to fix it other than a new $300 mule drive? Yes, we repair those mule drives instead of buying new ones. That shaft and frame housing wear out and let the pulleys go off at an angle. To repair this I take a 5/8″ nut, cut it in half, then put the 2 1/2″ nuts around the shaft and weld them to the mule drive frame and this will be as good as new.